Kitchen Window -- Getting Kids Into The Kitchen Tired of the same old ice pops? Try these cool treats from chefs and food writers to keep youngsters entertained this summer. Other kid-friendly ideas from chefs and food writers include Balsamic-Chocolate Cookie Ice Cream, Watermelon Slushie, Blueberry Fool and Spice, Crackle And Pop. Over the past few summers, my sons and I have made so many ice pops that we must be responsible for keeping the popsicle stick industry in business. When I suggested to my older son that we make them this year, his reaction -- and, frankly, mine too -- was, "Again?" It isn't that we don't love popsicles. But as he turns 11, I need to get more creative with summer recipes -- enough to interest him but not overwhelm his 3-but-thinks-he's-11-year-old brother. So I decided to get help from the big guns -- chefs and cookbook authors who face the same predicament. I'm confident their suggestions (which follow) will help me win "Coolest Mom of the Summer," or at least have well-fed and significantly less bored kids. Formula Freshen Up: When I e-mailed Associated Press food editor J.M. Hirsch about my ice-pop-boredom dilemma, his answer was to think outside the mold. "Pop molds come in tons of fun shapes and sizes these days. We own at least six or seven sets, including silicone molds, push-pops and some shaped like spaceships. Our basic recipe is orange juice, fat-free yogurt and a banana. We dump everything in the blender, puree until smooth, then freeze. You also can make a great fudge pop by pureeing low-fat milk, fat-free vanilla yogurt and melted chocolate chips." When I suggested to my older son that we make [popsicles] this year, his reaction — and, frankly, mine too — was, "Again?" Summer Science Lab: Both of my sons have figured out that I love it when they experiment in the kitchen. So I have been fed grapes dipped in peanut butter, apples coated with spreadable cheese, even onions mixed with unidentifiable sauce stuffed between two slices of bread. Virginia-based Meshelle Armstrong -- who, with her husband chef, Cathal Armstrong, runs Restaurant Eve (named for their 11-year-old daughter) and Eamonn's (their 9-year-old son) -- advised me to get the kids' favorite cookies and ice cream, and make ice cream sandwiches. I see oatmeal cookie-Chunky Monkey ice cream sandwiches in my future. An engineer turned food writer, Monica Bhide writes about food and its effect on our lives. Her work has appeared in The Washington Post, The New York Times, Food & Wine, Prevention, Cooking Light, Health and Self. Her latest book is Modern Spice: Inspired Indian Flavors for the Contemporary Kitchen (Simon & Schuster). Read more at her blog, A Life of Spice. Hail To The Trail: I love trail mix. My older son helped me on a project to create healthy versions, and since then this is a must-do summer project for us. Puffed rice cereal, dried fruits such as mango, cherry or plums, and nuts are a start. Add some imagination (we used diced dates and ice cream sprinkles), mix and serve. 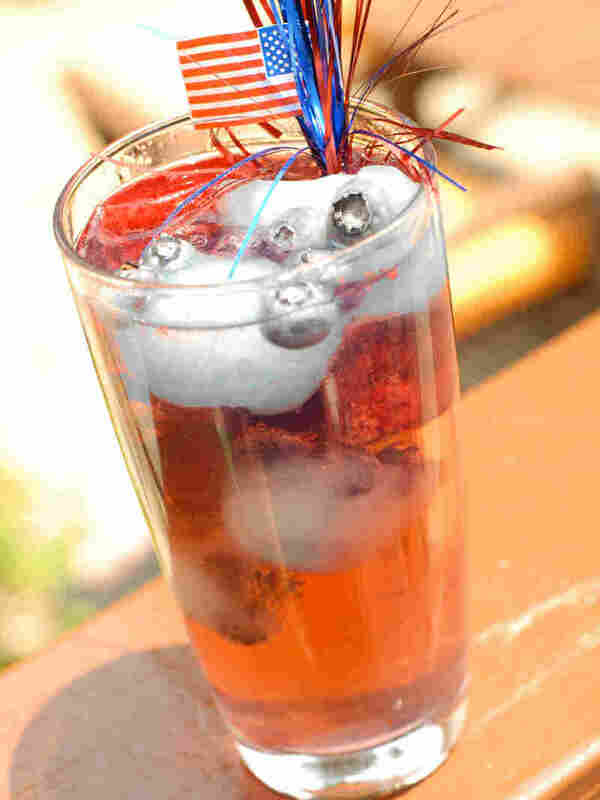 Sparkling Ice: Meshelle Armstrong provided another spectacular idea: "Fill an ice cube tray with a red or blue fruit-flavored beverage, such as cranberry-blueberry juice, and freeze solid. The idea is to use different colored juices. Drop three or four cubes into a glass, add sparkling water, and watch the special effects. As the cubes melt, colored bubbles will swirl through the seltzer." Freeze Whiz: We are big ice cream fans, so when Hirsch suggested healthy, food-processor "ice cream" for breakfast, which he makes with his 5-year-old son, I was totally intrigued. "Combine a 12-ounce bag of frozen fruit (mango, cherries, peaches, pineapple and blueberries are all delicious), a splash of juice (we often use orange juice, but apple, grapefruit, lemon or even water work in a pinch), a fresh -- not frozen -- banana and a pinch of salt. Process until very smooth, about 2 minutes. Eat immediately. It's cool, smooth and creamy." And the kids get to whiz the food processor. Over the past summers I've learned one thing we will do "again": Get the kids in the kitchen. By the time they are done, you have a creative, usually edible treat and a messy kitchen. More importantly, you have entertained, happy children. "Seriously. Just try it. You never knew ice cream could be this intense," writes J.M. Hirsch in his book High Flavor, Low Labor (Random House 2010). I did try it and found that my kids loved this vinegar-flavored ice cream. In a small saucepan over medium-low heat, combine the vinegar and jam. Simmer, stirring often, until reduced by half, about 8 minutes. Set aside to cool. Meanwhile, place the cookies in a zip-close plastic bag and gently pound with a meat mallet or rolling pin to break into small chunks. Set aside. 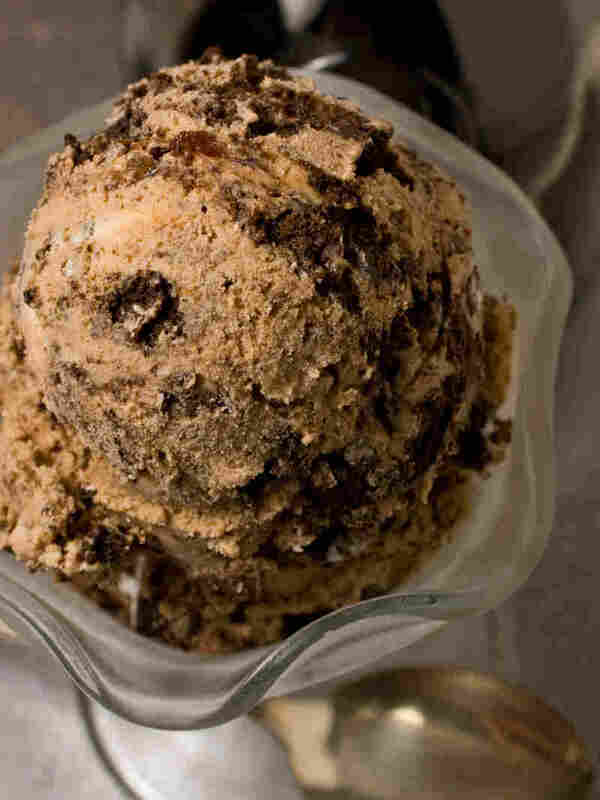 Once the vinegar has cooled, soften the ice cream by microwaving it in 5-second bursts until easily mixed with a spoon. It should be soft, but not melted. Transfer the ice cream to a medium bowl. Drizzle the vinegar into the ice cream and mix until blended. Mix in the cookies. Cover the ice cream and return to the freezer until firm, 2 to 3 hours. I like to freeze the watermelon for this recipe, but you don't need to. 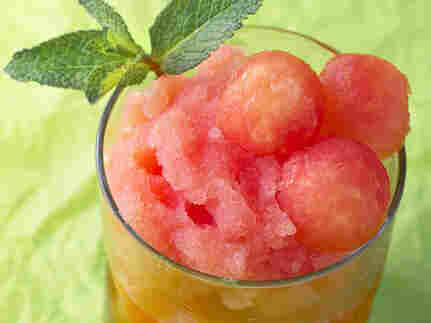 You can use unfrozen watermelon and throw 6 or 8 ice cubes into the blender instead. Also, the kids love to make melon balls using a melon baller to make the garnish for the drink. You can top with any fruit they like. Freeze watermelon for about 6 hours or until it is frozen through. Remove from the freezer and allow to thaw for about 10 minutes. Mix the honey and the lemon juice together. Place the watermelon and the lemon juice-honey mix in a blender. Puree. If the drink is too thick, add a little water or your favorite juice. Check for sweetness. Add additional honey if needed. Pour into 4 tall glasses and garnish with the mint and watermelon balls. This recipe is Chef Cathal Armstrong's daughter Eve's favorite. You can use other berries as well. We tried this in our house with diced ripe mangoes as a variation, and it worked fantastically. Wash and drain the blueberries. Remove any over- or under-ripe ones (a good job for kids). Combine the berries, water and sugar in a medium saucepan. Cook over medium heat, stirring occasionally, for 10 minutes or until the berries are soft and have released their juices. Transfer to a shallow bowl and set aside to cool. Beat the cream in a medium bowl with an electric mixer on high speed until soft peaks form, about 1 minute. Stir in the vanilla. Pour the cooled sauce over the whipped cream and gently fold until well combined. Cover and refrigerate for at least 2 hours. Spoon into glasses and serve. Eat with long-handled spoons, if you have them. This sweet/salty/tangy/crunchy recipe literally takes minutes to make, but have all the ingredients lined up before you start cooking, as they are added in quick succession. 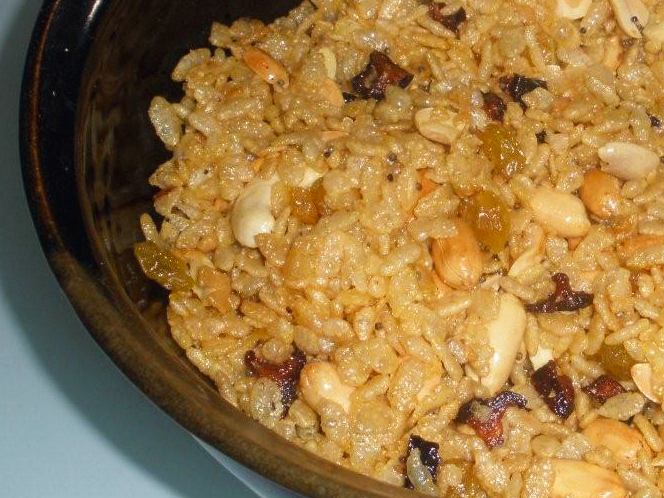 While traditional recipes for this mix use beaten rice flakes, this one uses crunchy Rice Krispies. Watch the heat carefully with this recipe, as the cereal can burn easily. Once you have mastered this basic recipe, you can alter it and make it your own -- try adding dried cherries or dried cran-raisins for color and zing. I love to add crushed red pepper just before serving. This recipe uses sev, gram flour vermicelli, a very versatile ingredient. When I was growing up, a distant aunt showed me how to make it -- a long, tedious and involved process of making gram flour dough and then making tiny vermicelli noodles with it. It is now available ready-made at Indian markets. You can sprinkle the sev on salads, top plain yogurt with it or even just munch on it as is. Serve this recipe with drinks, as an after-school snack or, as my son often asks, "Can I have the Indian Rice Krispies for breakfast, please?" This recipe will keep in an airtight container for up to a week. Heat the oil in a 5- to 6-quart nonstick pan over medium-high heat. When hot, add the mustard seeds and stir until the seeds begin to pop, about 30 seconds. Reduce heat to low and add the turmeric, peanuts and cashews. Stir for about 30 seconds or until the nuts are completely covered with the flavored oil. Keep the heat on the lowest possible setting. Add the cereal and stir until it is completely covered with spiced oil and golden throughout, about 1 minute. Add the sev, raisins, sugar, coriander, cumin, fennel and mango powder. Continue to mix (your hands are your best tools here) until the cereal is well coated with the spices, about 2 minutes.